You wish to have equal authority for your work as the responsibility. You have to talk to your co-worker about his bad attitude. Situations like these require sensible conversations to be had, but such conversations often don’t happen. The reason is simple, such situations are difficult! Most of the individuals find engaging in such difficult situations, and hence prefer avoiding them. But before you hop down to the checklist for ways that can help you make these difficult conversations simpler, it would be first wise to clearly understand what a difficult conversation actually is! A difficult conversation may also be called as a challenging conversation, it is a situation in which in any case minimum two parties are involved where they may have contrasting opinions, wants, and perceptions; or have contradictory emotions and feelings; or might have the fear of meeting significant stakes or consequences. This article intends to offer you support for handling difficult conversations at work. Now since you have comprehended the basic meaning of a difficult conversation, now it is essential to understand how you should respond to such a situation. As soon as you encounter a difficult conversation, the primary vital thing is how you respond to it. 1. Examine Yourself First: Just like you, the other person against you have entered the phase of a difficult conversation. In such state of affairs, you must not only be able to speak out the truth, but must also be able to handle what comes to you. The familiarity with how you handle yourself is the key to attain a positive conversation. 2. What is Your Emotional Response to a Conflict: The predecessor to a fruitful conflict management is a manager who is emotionally balanced and have the ability to manage his stress level, non-verbal communications, and emotions. You should therefore, check for how your body reacts to difficult conversations like impatience, anger, warning signs, and more. Check out for your warning signs! 3. Look at the role you adopt: As per the Transactional Analysis theory, an individual can undergo three potential states during a difficult conversation experience. You may either be highly spontaneous like a child, judgmental like a parent, or reasoned and logical like an adult. The transformation to a personality depends on the individual with whom you are communicating with. In most of the situations, it is wise if you go for the adult state, so that you have logic and reason for each and every statement. 4. Avoid parenting state in any case: Adopting the adult state is appreciable, it is better if you avoid ending up in the parenting state. The parenting state is more like blaming the other person, while the proactive adult perspective can help you prepare better for others response. It can help to turn the conversation into a positive meet. Before making a remark on others, it is always best to screen your own response. Since difficult reactions can occur at any point of time in a conversation, it is essential to acknowledge and handle it sensibly, before moving on with it. 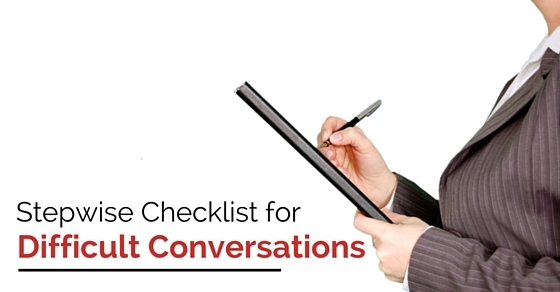 So, here are some ways or the best checklist for handling difficult conversations. 1. Alter your Mindset: If you have already labeled a conversation as ‘difficult’, then undoubtedly you will feel upset and nervous about it. Try to alter your state of mind, by considering the situation not as difficult, but as less positive. A difficult conversation goes well only if you handle it like another normal conversation. 2. Inquire Well: Develop an attitude of intense curiosity. Pretend you are trying to comprehend your opponent’s point of view and try finding out what is he thinking about the difficult conversation. If your counterpart is willing to talk then let him do that. Don’t take any chat personally rather try to learn about emotions and perception of other individual, before giving a final response. 3. See the Situation Clearly: Difficult conversations can become more intricate if your emotions and feelings are involved. Don’t let that happen if you really wish to give a fair judgment to a situation. Look for leadership qualities within yourself. The foremost quality of a leader is to not get disturbed with his emotions. Take some time to relax yourself and then view the situation differently, from your and others perspective. 4. Identify Your Goals: It is vital to be specific about your short-term as well as long-term goals, pertaining to a relationship. You need to ask yourself what specifically do you want from a relationship with your counterpart, and then react to a situation accordingly. If you wish to plan long-term relations with your opponent then it is necessary for you to avoid and overcome small or short-term issues. 5. Make a strategy but do not script: Note down key points that you want to speak on during the conversation. But also remember to not create a script as that can be a waste of time. It is because a script will make you perform artificially or weird during the situation. Your strategy must be flexible and include a repertoire of all expected responses. Also the language should be clear, simple, neutral, and direct. 6. Consider yourself in other person’s place: Put yourself in other individual’s shoes as this will help you understand other possible ways to react to a similar situation. Definitely, you have our own perspective, but you should also be aware of other person’s goals. Determine ways with which you can influence other person’s goals and strategies. 7. Go for a pre-conversation: Before you have the ultimate ‘difficult conversation’, go for a pre-conversation to procure much clear objective on the situation. The main agenda of the pre-conversation is to secure answers for all the questions that you are uncertain about. During such conversation develop a learning and curious attitude. You can also gather input from others on similar topic to have a better judgment. 8. Acknowledge your counterpart’s views/thoughts: During the preconversation you need to stay to a down-to-earth attitude. At the same time, it is vital for you to acknowledge your opponent’s perspective. If you are unfamiliar about your opponent’s problem then you should acknowledge that and ask for the same. Express your interest in understanding his point of view and try not to overlap your thoughts and opinions over others. 9. Select the right time and right place for the conversation to happen: When deciding about having a difficult conversation, picking the right place and the right time can make a big difference to the ultimate outcome. While deciding on these factors ensure that the other individual have right state of mind, and also the environment is pleasing and free from disruptions and distractions. 10. Stay Compassionate: Difficult conversations can be actually painful to both or one of the member. It is intelligent, therefore, to come with sensitive topics with compassion. Being considerate can help you manage difficult conversation with honesty and in a fair way. While staying compassionate, don’t ask your counterpart for the sympathy. 11. Develop a learning attitude: During a difficult conversation it is essential that you maintain a learning attitude. Think about why you came with certain reactions and what you must have said differently. You can also learn to cope from a situation by seeking experiences of others. You can emulate their tactics as a coping with a difficult situation is not just a skill, but an act of courage. 12. Advocacy: When you are sure that your opponent has expressed all his opinions on the topic, it is now your turn! Try expressing your perspective without deteriorating his position. You can begin with a problem and then end it up on a positive note. Clear him that you don’t intend to be a critic and that you have clear intentions about clearing out a problem. 13. Bring Empathy while conversing: Try to bring empathy in your attitude towards a situation as that will help you to better respond to a situation. Listen to your counterpart’s desires and also speak out yours. Repeat what he is saying as this will make him believe that you are listening to his words. Be open to find a different solution to each and every problem. If you intend to end the situation on a positive note then even the other person is also likely to reciprocate the same. 14. Stay focused on your success: Regardless of the outcome, your main concern is to stay focus on what you have learned and how much strong skills have you developed in order to overcome such situations. The main goal in this step must be to learn the precise tactic of overcoming any kind of difficult conversation, so that it does not disturbs you in the future. 15. Bring problem-solving solutions: Now that you have known it all, it is time that you build problem-solving solutions to the problem. If at any point of time, you find that the conversation is becoming adversarial, then you may go back to the inquiry step. Asking for others point of view before and during a conversation encourages him to stay engaged. Developing sustainable solutions at this step will be easy. Elements such as quiet words, self-control, and the way you communicate with others can create a remarkable difference to the outcome of a difficult conversation. Whether you have met a difficult conversation with your boss, or your colleague, or with your subordinate, it is essential that you think twice and follow the above checklist to reach to a productive and positive outcome.